The Amur Maple is native to Northeast China and Japan. 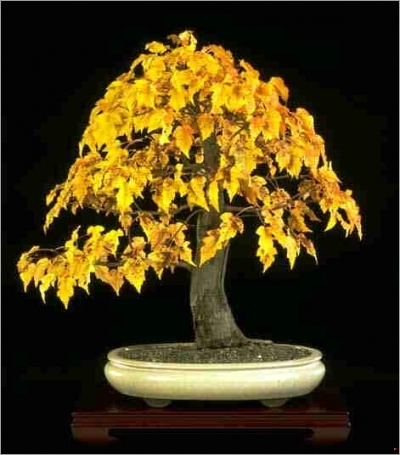 Amur maple has only started to attain popularity as a bonsai. It can be grown as a multi-stemmed clump or can be trained into a small tree with a single trunk. The tree grows about 20 to 30 feet tall in the wild. The bark is smooth, reddish in color and fairly thin. 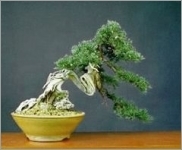 Acer Ginnala takes well to bonsai techniques. Due to excessive branchiness, some pruning is required early in the life of the tree to create dominant major branches. It tolerates heavy pruning. New shoots should be pruned through the growing season. Acer Ginnala may be wired, but like other maples, may require some protection of the bark. It is the only one of the simple-leaved maples for which the leaves are clearly longer than wide and the terminal lobe is much longer than the lateral lobes, often twice as long or more. Its Summer color is green, but is mixed with bright red samaras or 'helicopters' in Midsummer. This hardy tree and its varieties typically produce very colorful yellow to orange Fall foliage. Its leaves will reduce to under one inch if it is defoliated once every two years in mid-Summer.